Within the pages of L.G. Nixon’s new book, The Ghost of Darwin Stewart: Book One of the Lucy Hornberger Series, ($18.99, paperback, 9781545615904; $34.99, dust jacket, 9781545616871; $9.99, e-book, 9781545617694) readers will meet thirteen-year-old Lucy who is chosen to protect the Spectrescope, an ancient magical artifact that reveals ghosts and the invisible world of spiritual beings—both good and evil. Lucy must use the power of the Spectrescope to fight the evil forces. Nixon has crafted a fresh and reimagined telling of the battle of good and evil. L.G. Nixon lives in Michigan with her husband and family. She was born and raised in a haunted house in Michigan with a grandparent who could see ghosts, (without a Spectrescope!). Her previous work is titled Seasons: Celebrating God’s Majesty with Poetry and Photography. Xulon Press, a division of Salem Media Group, is the world’s largest Christian self-publisher, with more than 12,000 titles published to date. 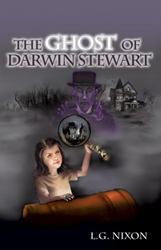 Retailers may order The Ghost of Darwin Stewart through Ingram Book Company and/or Spring Arbor Book Distributors. The book is available online through xulonpress.com/bookstore, amazon.com, and barnesandnoble.com.